Amazon is heading into the home stretch of its search for the city that will lay claim to the company’s second headquarters, or HQ2. Amazon has said it’s looking for a city with mass transit options, an international airport nearby, an existing labor force and a strong community and quality of life for future employees. Raleigh, North Carolina, came in first on the list, followed by Atlanta, Pittsburgh, Nashville, Austin, Denver and Los Angeles. 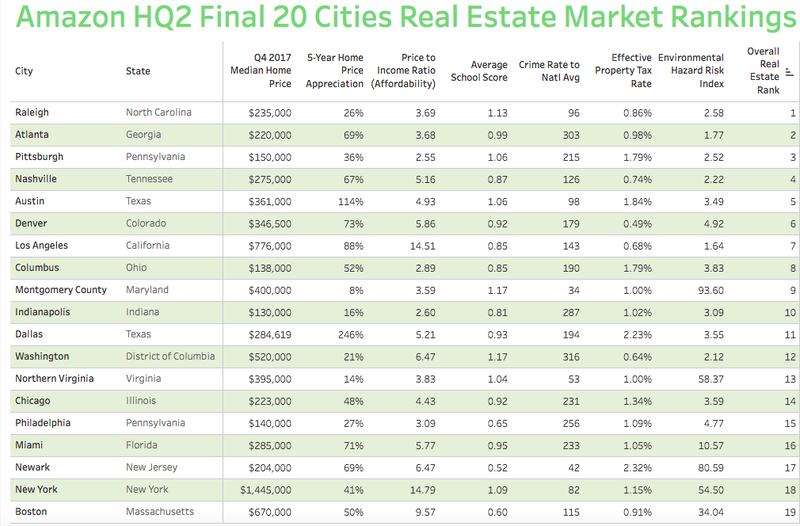 Northern Virginia, Zillow analysts’ pick for a likely choice, came in 13th, and Newark, New York and Boston came in dead last. Attom Data Solutions ranked these 19 cities based on crime rates, environmental hazards, home affordability, home appreciation, home prices, property taxes and school scores. The cities that came in on top based on those factors aren’t the ones analysts have so far favored Amazon to choose. In recent weeks, Amazon-watchers have agreed with Zillow’s earlier prediction that Washington, D.C., and northern Virginia are leading the pack. Montgomery County, Maryland, is also in contention in the Washington, D.C., area. Amazon promises to bring an economic boom to whatever city it chooses, leading cities to offer huge tax incentives, like a $7 billion promise from Newark and the state of New Jersey. Many affordable housing and community activists question whether Amazon’s presence would benefit or hurt their cities in the long run. Amazon’s first headquarters, in Seattle, has drastically reshaped the city over the past 20 years. Wherever Amazon deposits itself, housing prices will likely rise. If quality of life is Amazon’s no. 1 priority, Raleigh should expect a phone call. If not, some of the cities toward the bottom of the list — like Washington, D.C., northern Virginia and Montgomery County, Maryland — shouldn’t sit this one out just yet.